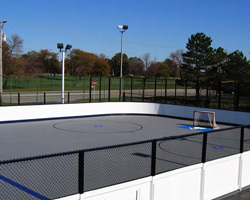 As roller hockey grows in popularity, Flex Court is here to meet the increased demand for a place to pursue it. Flex Court Roller Courts feature a high impact polypropylene co-polymer material built for the rigors of the game. This material is designed to allow for free air movement, which in turn limits moisture and bacterial build-up. Our roller hockey courts feature a bridge wall understructure that dates back a thousand years and is used in all free standing structures and bridges the world over. Our 4mm thick top layer is the thickest in the business, and its exceptional wet/dry coefficient friction allows for a safer floor regardless of the surface conditions. In addition, our locking system allows for staggered installation, which locks all corners in place and provides a smooth, level playing surface. Customize and personalize your court in your image. 16 colors are available in all, each certain to give your own personal home court advantage. You'll marvel at how our no sink surface makes the game faster and at how these amazing surfaces are engineered specifically for full response roller hockey. There's a reason Flex Court roller courts are the official surface for ESPN Pro Beach Hockey, Major League Roller Hockey, Speed Hockey, USA Roller Skating, the Canadian Hockey Inline Association, and many more. Gym Flex Roller Courts come with a 10 year Manufacturer's Warranty.